• The Kennels are licensed by Trafford Borough Council and are inspected by their appointed vet. • You are most welcome to visit the farm any day between 3pm and 5pm. We do not allow children into the kennels at any time. • Our current charges are listed in reception and on our general information sheet. • Boarding prices are per day, whatever time your pet begins their stay. 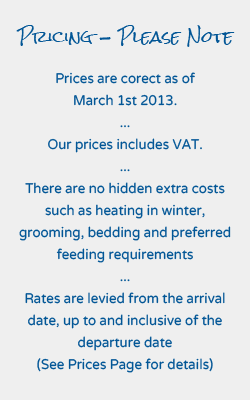 The price includes food, heating, fresh bedding and cuddles / exercise. Any animal boarding and collected by 11am on their last day will not be charged for that day - any animal collected after 11am will be charged another day's boarding. • The daily charge is the same even if you provide your own food or bedding. • Although we appreciate that you may return early from your holidays for whatever reason, you will still be charged for the length of time you booked your stay with us. • Any deposit paid is non - returnable. • Payment is by way of cash / card on arrival or departure. Please note, we do not take cheques. • All animals must be fully vaccinated before they arrive. For cats, this must include feline influenza and feline enteritis. For dogs, this must include hepatitis, leptospirosis, para influenza, parvovirus and canine distemper. We do recommend vaccinating against kennel cough - especially during the summer months. • Please bring your vaccination booklet - we will update your details on our computer. • We reserve the right to refuse any animal which, in our professional opinion, is unhealthy on arrival. 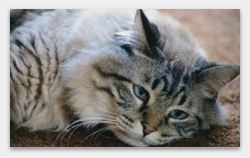 • In the event of a pet becoming ill, a vet will be called where necessary. If treatment or surgery is recommended every effort will be made to contact you to obtain consent. In the event that contact can not be made, the customer agrees to accept the decision of the vet selected by Reed House. The owner will be responsible for all costs incurred. • Owners must provide full and accurate details of any medical problem, as no responsibility can be taken due to any undisclosed information. • In the event of an animal not being collected, or boarding fees not paid, we reserve the right to dispose of any animal not collected within 14 days of the date arranged if no communication is received from the owner or their representative. • Please see our rehoming page for pets looking for a loving home.